Welcome to the Prince August Tutorial on making a Nativity set. This month we concentrate on casting and filing the figures. The Nativity set is actually very easy to cast as no assembly is required to complete the figures. 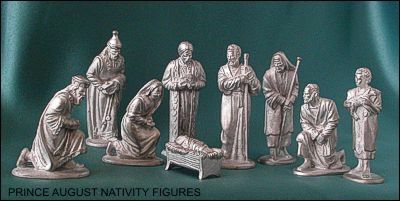 We have chosen the Joseph mould for an example, however all the figures can be cast in exactly the same way. 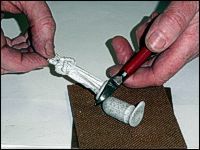 You will need model metal (lead & tin mix) ingots to cast these figures but you can use our 5 star lead free metal if you have more experience. 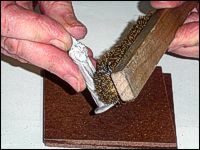 We estimate that one bar of model metal can cast two 54mm Nativity figures. So you should have 5 bars to be sure of enough metal for all 9 figures. Metal can be reused again and again, all parts clipped off can be remelted. Remember you should have adult supervision if you are under 14 years. Before starting it is always advisable to heat the mould and use it while warmed. 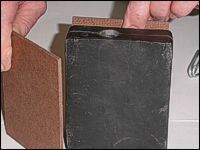 This removes dampness, which can cause the hot metal to splatter and to allow a better flow of metal in the mould. The temperature may vary depending on the mould and metal used but I find that between 30 degrees and 40 degrees Celsius best. You can easily set the temperature in most ovens. Always apply dry talcum power to BOTH parts of the moulds from edge to edge. This protects the mould. More importantly this practice allows the air to escape during casting. Always slap mould halves together to remove excess talcum powder. Next add the support boards, then hold them firmly in place with the metal supports. The support boards protect the mould and also spread the pressure applied by the clamps across the whole mould. Do not over-clamp the mould as two should be sufficient. 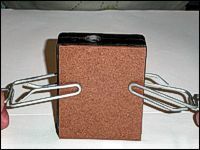 Over-clamping can prevent the escaping of air through the mould. The quicker the air can escape the better the fill. This can often be overlooked and lead to gaps in the casting. Use dry metal or metal may 'spit'. An electric hob is preferable for better control of the heat but if using a gas flame then place an old wide saucepan over the flame and then use the ladle on the saucepan heat metal. 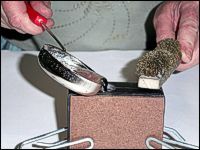 Stir the melting metal with the back of a used match (just use the wooden end) before pouring the metal. You can tell when the metal is hot enough when the match end starts to brown and produces a small amount of smoke. 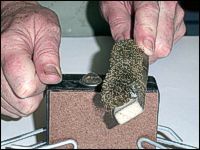 If the match blackens and smokes heavily, the metal is too hot and will burn the mould. Push any slag (floating scum) away from spout of ladle you want to pour from to avoid getting the slag into the miniature body. Pour slowly until metal fills the hole. While pouring and for a few seconds after it is advisable to tap the mould gently with a piece of wood. This helps settle the metal in the mould. 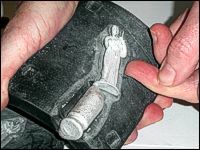 Carefully BEND the mould when removing the figure and you reduce wear and tear on the mould (which makes casting in future more prone to errors) and damaging the figure. It is very annoying to find that when cutting away the excess metal you have accidentally damaged a piece of the part you want. 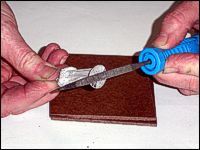 To avoid this, it is advisable to cut at least 2mm from the part especially when cutting thicker sprues. File following the contours of figure smoothly and evenly. Remove sharp corners and bevel edges to prevent paint peeling. Polishing will show up any parts missed during filing, and helps to remove file and tooling marks. Do not brush too hard (lightly brush) for the best results. You may reduce fine detail otherwise, especially around face or decorations. Total casting time should be about 10 to 15 minutes.